Archeological evidence suggests that grape growing, and subsequently wine making, originated in the middle east. Asia MInor is thought to be the birth place of the grape. Traces of red win in King Tut’s tomb have been confirmed showing that wine making has been around for a very very long time. However, it is Europe, and now the “New World” that gets accolades for producing oustanding wine. Well, that may be changing as wineries in the middle east take back their once lost heritage from Europe. By far the greatest wine production in the middle east occurs in Israel. However, other countries such as Turkey, Lebanon, Cyprus and the Georgia Republic are making their marks. Although wine making is quite old in these regions of the world, prohibition of alcohol in Islamic societies have kept them from truly reaching their potential. Several “noble” varieities of grapes that we know today as being developed in Europe are now making their way back to the Middle East. In ancient Turkey, winemaking began in the region between Thrace and the Caucasian mountains. There are now about ten wineries in Turkey producing independently. Two of the best knowns are the Doluca winery and the Kavaklidere Winery. In the early 1990’s the Doluca winery, under the Sarafin label brought the noble grapes of Chardonnay, Sauvignon Blanc, Cabernet Sauvignon, and Merlot back to Turkey and planted them in the Gallipoli Peninsula on the shores of the Aegean Sea near Saros Bay. In 1996 they produced their first vintage and sold their first bottle from these grapes in 1998. They now offer five noble varietals (they added Fumé Blanc) and their wines are carefully produced by Doluca winery in Mürefte. The Doluca winery was established in 1926 and is one of the oldest in Turkey. They produce several red and white varieties from grapes local to Turkey as well. They produce red wines from the Karasakiz grape as well as from French Cinsault in the Marmara region. Another grape from eastern Anatolia is the Bogazkere grape. White grapes include Sultanina from the Aegian region and Semillon from Thrace. The Emir and Muscat grapes grows in the central Anatolia area. 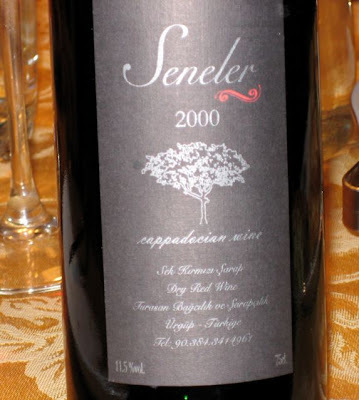 These and several others make for the production of distinctive Turkish wines. Recently I had the great fortune to taste some Turkish wines from the Turasan winery in Cappadocia. My dear friends carried them back from Turkey and served them last weekend with a Turkish feast (thank you guys). It was a very memorable evening and the wines were quite impressive. The first wine we tasted was a 2004 dry red wine made from a blend of okuzgozu and bogazkere grapes. This had a light red color. Bright red fruits were presented on the nose. It had a forward acidity that was quite sharp and an interesting blend of light black raspberries and cherries. There was something else in there that is hard to describe so I’ll just say it reminded me of a mineraly dirt. I guess this would be the Turkish terroir influence. It was a light bodied wine that actually paired well with tomatoes and eggplant and olive oil in some of the Turkish food. The 2004 pure okuzgozu had a lot of similarities with the blend. However, it was much smoother and had less of the mineralness that I detected in the first wine. The acid was softer and the bright fruits came out a little bit more. These had minimal tannins and were easy drinking wines. The 2000 Senelar took me by surprise. It was much more earthy than the previous wines. It had a darker color and a little more body. It really tasted like an old world European wine. Imagine cherries mixed with olives, earth, and a touch of maple syrup aroma (not sweetness). It reminded me of a light sangiovese or a lighter French wine. 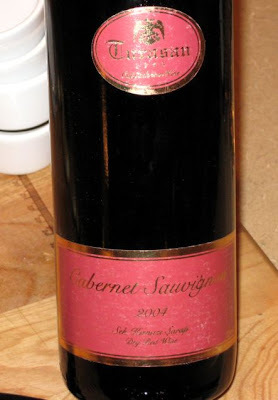 By far the most intense and full bodies wine we had was the 2004 cabernet sauvignon. It had a deep red color. On the nose among the red and black fruits I detected wisps of watermelon rind and leather. It also had a woody smell reminiscent of cedar planks. It had vegetable flavors mixing fruits with tomatoes and greens. The tannins were present but smooth and at the end of the palate I got dark chocolate and espresso. An interesting and unusual wine. I would say that Turkey can produce wines of excellent quality.